Billie, who is known to be a longtime Beliber, had the time of her life when she met her idol in person. Justin Bieber's focus in the last few months has solely been on his mental health and looks like the Canadian pop singer is on a path to recovery. The 'Sorry' singer attended the Coachella music festival and was there for his friend Ariana Grande''s epic set which was a rage on social media. 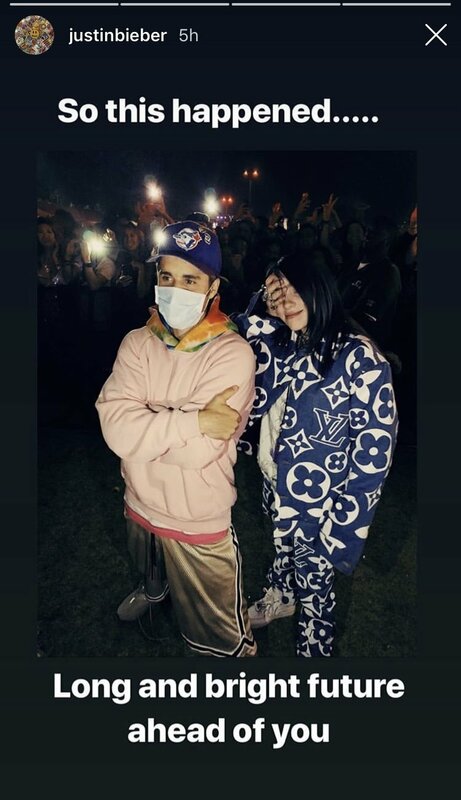 Justin thoroughly enjoyed his time and also took to social media to share a moment he had with American singer and songwriter Billie Eilish. Billie, who is known to be a longtime Beliber, had the time of her life when she met her idol in person. According to a report in Paper, Billie in her numerous interviews has spoken about her tween Bieber obsession. However, she recently confessed to Ellen DeGeneres that despite her music industry success, the two were yet to cross paths. In February, she told Marie Claire she was afraid to meet Bieber, in case she cried in his presence. We would not be surprised if the singers soon announce a collaboration. Whereas Ariana Grande's performance was the highlight of the festival and fans could not stop praising the 'Thank U, Next' singer.